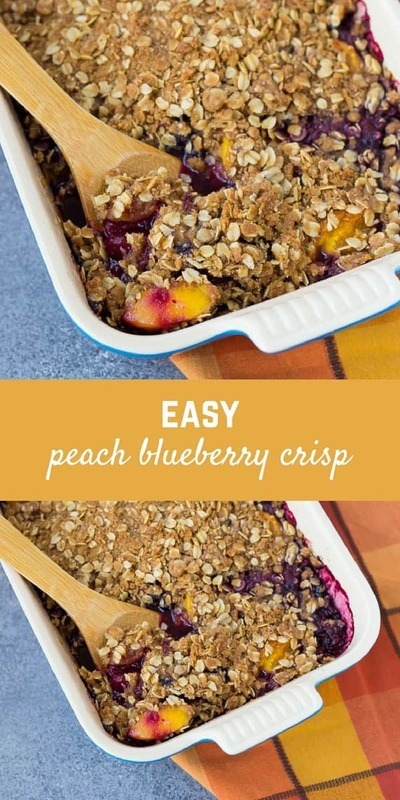 This peach blueberry crisp can be made with fresh or frozen fruit, making it a perfect dessert all year round! 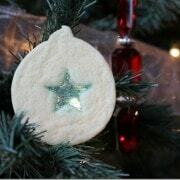 It’s perfect with a scoop of vanilla ice cream. Okay, I know I’m pushing the limits of summer here. I’m squeezing one last recipe that’s reminiscent of summer before it’s all pumpkin, squash, apples, and sweet potatoes. I thought about saving it until next spring but it’s one of my favorite things to eat, and I make it all year round. It turns out perfectly with frozen fruit. 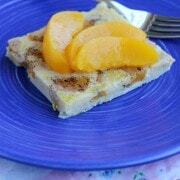 In fact, even during the summer months, I often will use frozen peaches. I’m a little lazy and I don’t love peeling peaches. It’s the fuzz…I just don’t really like touching peaches. Does that make me sound like a weirdo? I can’t be the only person that shivers at the touch of peach fuzz. Am I? Fruit crisps of any type are some of my favorite desserts. 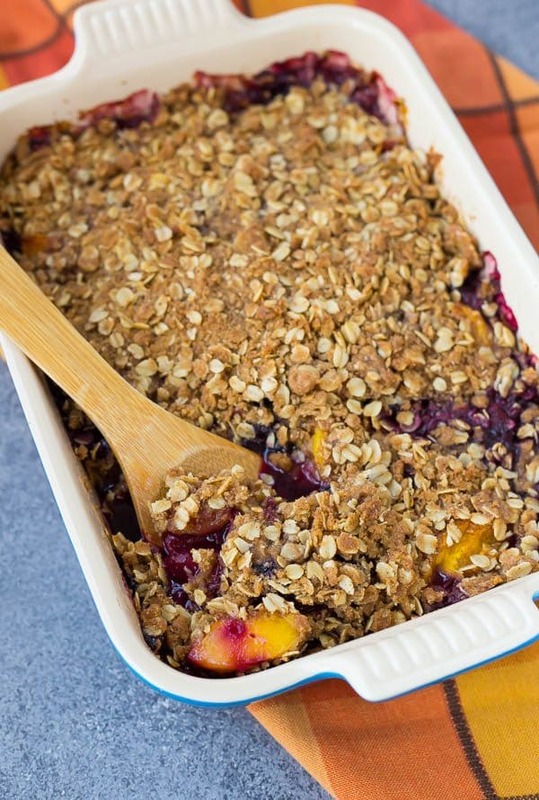 (Have you tried my apple blueberry crisp?) If I had to choose between this and a slice of chocolate cake, the choice would be so easy — crisp wins. Choosing between crème brûlée and this, well, that would be a little more difficult. 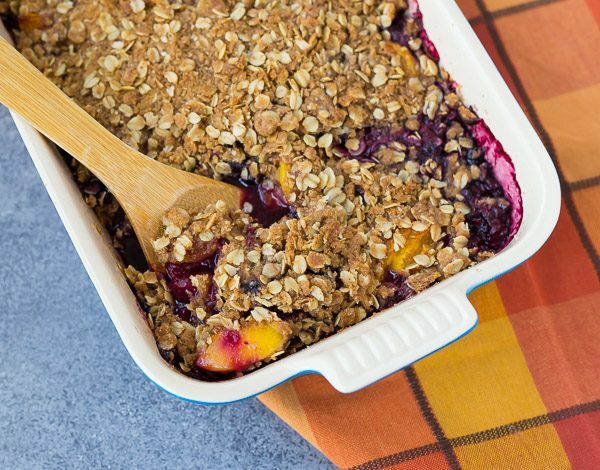 I’ll take the crème brûlée for dessert and save the peach blueberry crisp for breakfast the next morning. I imagine it would be good with a scoop of vanilla yogurt on top of it at breakfast time….but I’m just imagining that. I’ve certainly never eaten it for breakfast. Not more than 25 times, at least. PS: Do you love crème brûlée as much as I do? Make sure to check out this easy crème brûlée recipe – you won’t believe the cooking method! 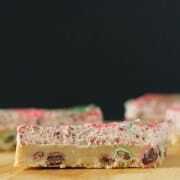 This is a great dessert to make for guests because it makes your house smell amazing, it’s easy to prepare, and it’s great warm or as it cools to room temperature. I’ve made this for company multiple times and people always rave about it. Then I hide the leftovers so I can eat it for breakfast. If you’re topping obsessed like me, double the topping ingredients. It’s a little obscene and a totally over the top ridiculously ratio of topping to fruit, but it’s pretty irresistible! I love fruit crisps so much that I’ve turned them into other things! 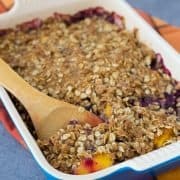 Try these apple crisp breakfast cookies or my blueberry apple crisp smoothie bowl. Preheat oven to 350 degrees Fahrenheit. Spray a 9×13-inch baking dish with nonstick cooking spray. In a large bowl, mix fruit with cornstarch until fruit is coated. Pour into prepared baking dish. In the same bowl, combine flour, oats, cinnamon, nutmeg, and brown sugar. Cut in butter using your hands or two forks until no large chunks of butter remain. 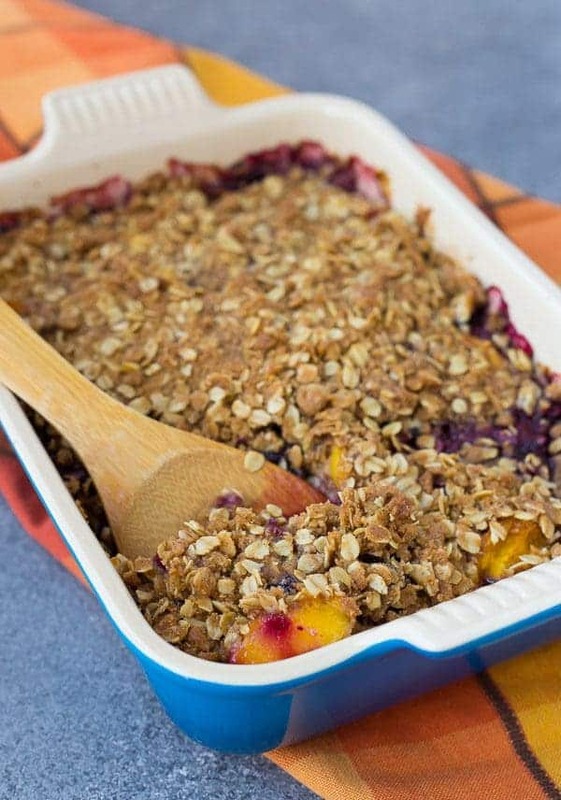 Bake for 45-60 minutes or until golden brown, bubbling around edges, and peaches are fork tender. Serve warm — it’s great topped with vanilla ice cream! 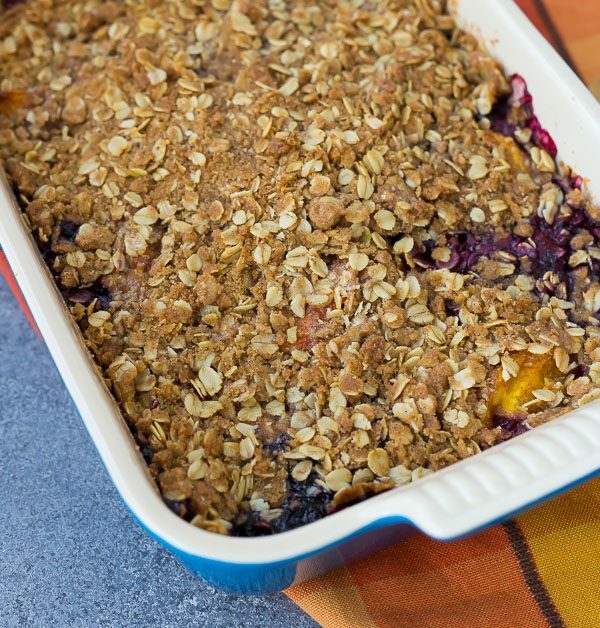 Verdict: I could eat this peach blueberry crisp every day, all day. Husband’s take: Ben loves this dessert! My mother-in-law at first said she didn’t like desserts like this, but once she tried it, she changed her tune! Changes I would make: None are necessary but have fun with other types of fruit!